Good Evening my friends! I'm racing to post this because I wanted to share it with you tonight... and we're eating it for dinner within the hour! A while back, I became blog friends with Maria Isabella of Bits and Pieces blog. She lives in Cleveland, Ohio and has written a book called, "In the Kitchen with Cleveland's Favorite Chefs." Maria asked each featured chef what they would prepare if they had one hour or less, for good friends unexpectedly stopping by. I love that! I always want to know what real chefs eat at home. The description on her book says, "Each chef shares detailed recipes for delicious signature meals that can be prepared quickly and easily at home -- 119 dishes in all, including a wide range of meat, fish, and vegetarian choices to tempt every palate. Helpful wine pairings are offered as well. Accompanying each recipe are gorgeous full-color photographs featuring both the chefs and their culinary showpieces. Isabella's profiles of each chef offer fascinating insights into everything from personal life stories to tips for successful last-minute entertaining." 1. Preheat the oven to 375º. 2. Combine the leeks, 1 tablespoon of the oil, the parsley, garlic, ½ teaspoon salt, ¼ teaspoon pepper, and lemon zest in a bowl. Add the salmon fillets and toss until well coated. 3. Fit a wire rack into a rimmed baking sheet. Place the salmon on the rack and bake for about 12 to 15 minutes, or until lightly opaque inside. 4. Meanwhile, heat the remaining 1 tablespoon oil in a sauté pan over medium to medium-high heat. Add the mushrooms and season with the remaining ¼ teaspoon salt and about ⅛ teaspoon pepper. Sauté until lightly caramelized to bring out what Jim describes as “the umami flavor” (or savoriness). Remove the pan from the heat. 5. Place one salmon fillet in the center of each plate. Spoon the tomatoes and mushrooms around the fillets. If desired, arrange a few strands of leek garnish on top of each salmon fillet. Serve warm. Note: To clean a leek, cut off and discard the dark green leaves just at the place where the light green starts, about an inch above the white part. Trim off the roots, then make a lengthwise cut from the top down almost through the bottom. Rinse the leek thoroughly under cold water, separating the leaves to make sure to get any dirt that may be hiding between them. Drain well and prepare as instructed. 1. Simmer ¼ cup finely julienned white part of leek in a saucepan with ½ cup vegetable stock until tender, about 5 minutes. Drain. I followed this recipe, but forgot to buy a lemon. Oops. So I gave the marinade a little hit of lemon juice. I love mushrooms. Especially shiitakes. I can tell you that I prepared this amid guitar and recorder practices happening in two separate rooms, fighting that broke out about phone usage, a dog going wild because she lost her ball under the couch (for the millionth time this week) and homework questions like, "Hey mom, what's a predicate?" Somehow, I was able to prepare this simple dish, and it turned out so amazing that I'm forcing myself not to nibble before we congregate at the table. I'm serving it with rice. Mmmmm. I forgot to mention that I am guest posting here, for Maria with a recipe for GF carrot cupcakes that I got from my friend Lissa a few years ago, and Cinnamon cream cheese frosting. Please feel free to stop by and say hi to us over here! 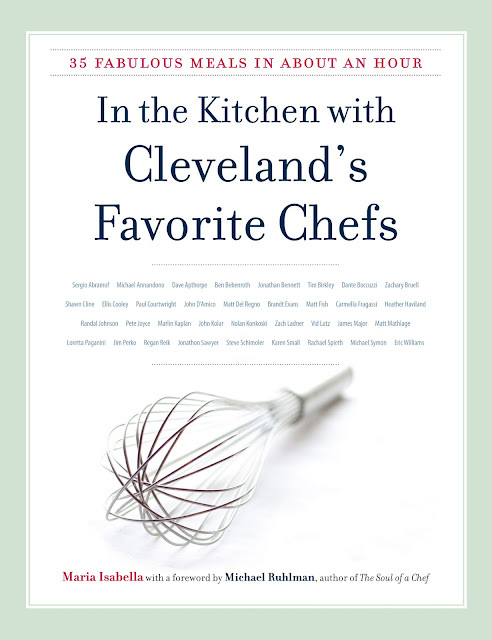 And if you'd like to win a copy of Maria Isabella's book, please leave us a comment here, answering the same question she asked Cleveland's chefs- "If you had good friends arriving in an hour, what meal would you whip up?" I love cooking and am always interested in new recipes and chefs. That looks amazingly easy and delicious. Great job, Sasha! If I had friends arriving in an hour . . . I would whip up a Chicken Alfredo Lasagna. while the boys make a big green salad. I would whip up a Deep Dish Apple Pie (which will bake while we eat the lasagna). Papa would pop over to Edaleen Ice Cream to pick up some French Vanilla Ice Cream for the pie. I think I would make a big greek salad. I love the sound of this cookbook. Chicken with wine and mushrooms. Green salad with feta... pine nuts sauteed in olive oil and seasoned with greek seasoning...tossed into the salad with a splash of balsamic. I would send Mr D to fetch a fresh baguette! Fancy food... Wow!! Don't enter me. You know I wouldn't use it;) Inspiring and beautiful food though. Hmmm...i would make chicken rice pilaf. Something i grew up on. My new favorite dish, the Honey Lime Chicken Enchiladas that is all.over. Pinterest! Looks like a great book - is it on Amazon or is it just sold locally (in case we don't win it)? I love those Honey Lime Chicken Enchiladas. I am actually making them again tonight! Thanks for your lovely photojournalistic essay of this recipe from my book, Sasha! As always, you capture everything so beautifully. And just as an FYI to all your readers, chef Jim Perko is the head chef at the Cleveland Clinic (which is world renowned for its cardiovascular department). So, naturally, this dish is entirely heart healthy. And yes, slip4, my book is available on Amazon, too. Just type in the title at www.amazon.com. Good luck to everyone who enters this contest! Yum-O!!!!!!!!!!!!!!!! I am always looking for salmon recipes--we all love it here: ) Thanks! Would it be cheating to say this recipe? This will be dinner this week...I love everything about it. Hmmm...Probably my Pesto Pasts with Pinenuts. Thanks for the chance to win, Sasha! I would probably make zucchini & bacon lasagna. It's super easy ans tasty. I do love the recipe of this salmon though, plus heart healthy is a plus. Thank you for hosting this lovely giveaway Sasha. The photos are just beautiful. The book sounds great! I would make Gorgonzola pasta, grilled chicken and salad. Easy and fast. Your salmon looks AMAZING! I will give this recipe a try - always looking for something new to make. I would whip up a good ol' Mac and Cheese casserole recipe that I have and does not stress me out. Add to that a garlic bread and voila! This looks amazing. I would make spaghetti and meat sauce, garlic bread and a salad. Simple and delicious. Ooooh, I've just had a little look around Maria's lovely blog and spied your carrot cupcakes (love your photos by the way). If I had to whip up a quick meal, I would make risotto. It's quick, I've made it a billion times and it's fail-safe and I've always got enough vegetables and ingredients around to make it delicious. Plus, not a lot of washing up. And if I was super-speedy, it doesn't take too long to make shortbread cookies which would smell welcoming in the oven as the guests were arriving. Oooh! What fun! The salmon looks amazing! Can't wait to give it a shot. We would probably serve steak with some marinated zucchini and a yummy salad full of baby greens, roasted walnuts, blueberries and gorgonzola. Beef enchiladas is my quick choice. I'll have to try this salmon recipe...sounds great! Thanks for the chance for the book....I'd LOVE it! Thanks for the opportunity. My go to last minute meal is a roasted vegetable tomato pesto pasta. I usually have the ingredients and is always a crowd pleaser. Sometimes I add chicken sausage if I have it. Your salmon dish looks delish. I'm gonna give it a try for my salmon loving husband. Probably hamburgers on the grill and homemade french fries. Simple I know but what is better than gathering around a pack porch grill with those you love! Thanks for the opportunity to win the cookbook--it sounds lovely! Oh, I'd love to win this cookbook! and in the winter, my go-to meal is something in the crockpot...taco soup or white bean chili. If the weather is nice and warm, I'd probably grill something. Otherwise, I try to always keep a box of pizza crust mix in my pantry. It's so versatile. You can make it into an appetizer with caramelized onions and feta. Or, you can make a pizza for dinner using anything you have on hand. You can go Mexican with black beans and corn, or Mediterranean with artichokes, olives, & chicken, or you can go regular Italian with red sauce. This cookbook looks awesome! The cookbook looks great! I would make some baked chicken, smashed potatoes & a nice salad. I'd be thrilled to win this terrific give-a-way! That salmon looks delish! I would bake some lemon garlic chicken, baked sweet potato fries, nnd a salad. The prep is simple, but the results are yum! For me, it would completely depend on what I have available! Lately, I haven't been keeping a good selection of food on hand, since I've been traveling so much. But I usually have some brat patties in the freezer. So grill those up with some seasoned potatoes. YUM! Probably some type of delicious salad with some crusty bread! The salmon dish looks amazing! Bet it was "scarfed" down in no time! Blessings! Rice and pink beans (Puerto Rican Style - takes 30 minutes), sandwich steacks seasoned with abobo, browned and steamed with onion rings (can be ready while we wait for the rice to be ready), and a salad. I am not a cook but I ALWAYS need to prepare something that takes one hour or less! I'd make a spinach salad with red onion, blackberries, sugared almonds, gorgonzola cheese, and grilled chicken. for desert we'd have a bowl of ice cream drizzled with homemade fudge... I just happen to have sitting in my fridge. I would make pasta and a big salad. So easy. Probably grill some fish and make a big salad and some wild rice!! This sounds like a great read-thanks for the opportunity to win! Baked Ziti, baby! It's so smooth, comforting and creamy!! I hope I win the book!! Sounds fabulous! I would love to win this, always looking for new good recipes. In an hour I would probably make salmon burgers w/ salad or yam fries. Wow! This cookbook sounds great. I would love a chance to win. And I love it that you could share a recipe with us. I can't wait to try it. It looks wonderful. Makes me hungry now! If I had to cook for unexpected company, I'd probably fix Chicken Alfredo, Salad, Garlic Bread and Cranberry Oatmeal Cookies for dessert. Penne with roasted vegetables and freshly grated Parmigiano Reggiano. A main dish salad with crusty bread. May flowers... and a little GIVEAWAY! "Stop picking the flowers for crying out loud!" Sweet Jeanne and a GIVEAWAY! !